SEATTLE (AP) — Less than a week ago, Matthew Boyd was trying to figure out how to slow a Seattle lineup that included Robinson Cano and Nelson Cruz in the middle of the batting order. It was a bit easier for the Detroit left-hander on Thursday night with Cano now suspended and Cruz nursing a sore foot. 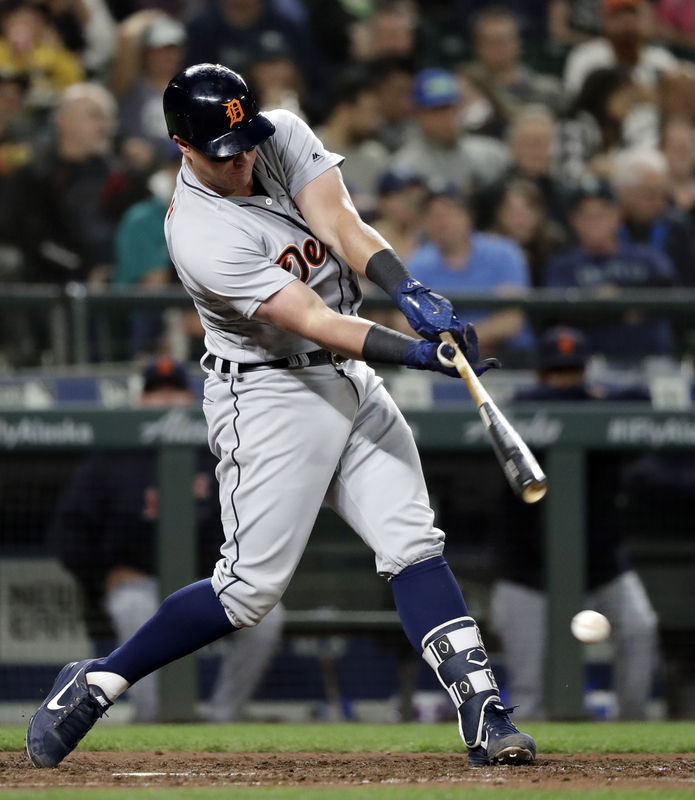 Boyd was the beginning of a strong pitching performance that kept the Tigers close long enough for Jose Iglesias’ two-out, two-run single in the eighth inning that gave Detroit a 3-2 win over the Mariners on Thursday night. Boyd struck out a career-high nine and didn’t factor in the decision but was part of a solid night by the Tigers’ staff. After Mitch Haniger’s RBI single in the third inning, the Mariners’ only hits were a pair of singles by Guillermo Heredia — one in the fourth and another leading off the seventh inning. Boyd combined with Buck Farmer, Blaine Hardy, Warwick Saupold (2-1), Joe Jimenez and Shane Greene to retire 20 of the final 23 batters faced. Jimenez struck out the side in the eighth inning and Greene pitched the ninth for his 10th save. Detroit rallied against Seattle’s bullpen and specifically eighth-inning regular Nick Vincent (1-1) to take the opener of the four-game series. With two outs in the eighth, Vincent allowed a single to Mikie Mahtook and walked James McCann to load the bases. Seattle stayed with Vincent and Iglesias got enough of a 1-0 cutter to send it up the middle and off the glove of shortstop Jean Segura diving to try and stop the grounder. The rally by Detroit came an inning after Seattle failed to add to its lead after having runners at second and third with one out. Dee Gordon struck out and Segura grounded out, ending Seattle’s only scoring opportunity after the third inning. Seattle starter Marco Gonzales was cruising into the sixth inning and should have gotten out of the inning without allowing a run, but Kyle Seager’s two-out throwing error allowed John Hicks to score Detroit’s first run and ended Gonzales’ night. Heredia had a two-out RBI single in the second inning and Haniger’s RBI single in the third gave Seattle a 2-0 lead. Boyd was pitching back in his hometown for the first time in his career. Boyd grew up in nearby Mercer Island, Washington, just a few miles from Safeco Field. Boyd said he gave out 38 tickets to family but saw countless other friends around the ballpark. “It feels good to be so loved,” Boyd said. Seattle selected the contract of RHP Ryan Cook from Triple-A Tacoma before Thursday’s game, completing a two-year journey through major injuries to return to the majors. Cook was an All-Star with Oakland in 2012, but the past few years have been marred with injuries and recovery. Cook missed the entire 2017 season recovering from Tommy John surgery and a nerve issue in his right hand. His 2016 was cut short by a lat muscle strain and a torn hamstring. Cook made his season debut entering in the sixth inning with runner on second and third and two outs. He struck out Iglesias swinging with the tying run at third base, and followed up with a perfect seventh. It was his first appearance in a major league game since in Sept. 16, 2015. “It wasn’t a soft landing. He hadn’t been in the big leagues for a couple of years and we fired him in there, he went right after them,” Servais said. Tigers: OF Leonys Martin will do pregame work on the field on Friday as he continues to recover from a left hamstring strain that landed him on the DL on May 9. Martin took batting practice early on Thursday. Mariners: DH Nelson Cruz could be back in the lineup on Friday after getting hit on the foot in Tuesday’s game. Tigers: RHP Michael Fulmer (1-3) was knocked around for six runs and six hits in 4 1/3 innings in a loss to Seattle last weekend. Fulmer has allowed 11 earned runs in his past two starts combined. Mariners: LHP Felix Hernandez (5-3) looks for a cleaner outing than his start last Saturday against Detroit when he got the victory but allowed eight hits and five earned runs in five innings.